Confession: when I travel and have a long layover during an appropriate mealtime, I always rejoice when I see a TGI Fridays. Why? Green bean fries, man. I love them! Do you like how I keep my green bean fry obsession only during “appropriate mealtimes?” If it’s before 10am, then I go for the Auntie Anne’s pretzel. Breakfast of champions. OK. So, I may have some questionable travel habits. I’ll admit it. But there is nothing questionable about these baked asparagus fries. So good and (I’m sure) so much better for you than those deep fried things I’m obsessed with. I was actually going to make green bean fries, but I found I had some ripe asparagus readily available in the refrigerator. So I decided to try using that instead, and I’m so glad I did! I’m pretty sure this is my new favorite way to eat asparagus. 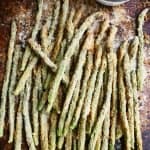 Baked Asparagus Fries, serves 4-5 as an appetizer. In a large, shallow bowl or plate with a lip, whisk one egg. In another large, shallow bowl or plate with a lip, combine 1/2 cup bread crumbs with 1/4 cup Parmesan. Dip the asparagus in the egg, then into the bread crumbs. Set on a plate until you’ve dipped all of them. About half way through I like to refresh my egg and bread crumb plates because clumps will begin to form. You want a thin, non-clumpy coat of each of these elements on the asparagus before they go in the oven. So don’t be afraid to clean off those bowls or plates and refresh if you need. While those bake, it’s time to make our creamy lemon sauce. Guess what? There’s only two ingredients plus seasoning needed. Whisk together 1/2 cup mayo with the juice from one lemon. Taste and add salt and pepper to your liking. Easy right?! These seem heavenly. I’m definitely going to have to try this out. This weekend is the asparagus festival in Stockton, California. I need some asparagus in my life!!! Ooooo….now you are speaking my love language!! This combines a lot of my favorite flavors. I will definitely be trying this one! This looks so delicious and easy! I just moved this week and have only a sheet pan and a few other dishes with me right now, but I could totally make this with what I have! Thanks for sharing! This is definitely the best way to enjoy asparagus! I’ll be getting a lot of use out of this recipe. Bad habits totally don’t count when you’re travelling, right?? These look amazing. Hello spring! Yum! This looks amazing—I am definitely going to have to try this! We love asparagus in my house and this looks amazing.. and perfect to go along with summer grilling recipes! Pinning! I’ve been obsessed with asparagus recently! This sounds so good! This is great! We love roasted asparagus in our house, and always end up eating them with our fingers like fries. This looks like a very tasty way to mix it up, and the dipping sauce looks yum. Adding to my Pepperplate app. Thanks! These look great! We are already big fans of roasted asparagus in my house, and usually end up eating it like fries anyway. This looks like a tasty way to mix it up, and the dipping sauce sounds yum. I’m adding this to my Pepperplate app. Thanks! I usually hate asparagus. But this recipe looks tempting enough to give it another try! Ah these look so delicious! I fell in love with asparagus just a few months ago and ever since I just can’t get enough. Now I guess I just have to wait until it comes into season so I can buy a tonne more of it. Yum, looks delicious and healthy! What the heck? These look delicious! I need to try it. Looks so good. Hi. Will try it out soon, can’t wait! Looks awesome. These look amazing. I’m going to try. Ohhhh I am saving this one, for sure! And, green bean fries?? WHY am I just now hearing about this?? No no no. These look too sinfully delicious to shar ewith my friends. mmmm!! The perfect seasonal recipe!!! And I love lemon mayo… have you tried it with fish? I think they belong together! This looks delicious and so easy!!!! I had some asparagus left from the weekend so I made these last night. My husband loved them! I really like the dipping sauce – not too sweet, not too tart (I added 2 tbsp lemon juice to the mayo). The asparagus I had were very thin stalks so the coating didn’t adhere as well as pictured. Next time I would buy asparagus that is a little thicker. This looks so yummy! Asparagus is my fave veg! These look so good! I think my husband would even eat veggies if they were this tasty every night! I was just looking at the asparagus in my fridge and wondering what to do with it…I am totally going to make this! Never seen asparagus done like this – will definitely give it a try! holy bat O_O these look delicious!! A BUSHEL? Do you realize how much asparagus that is? You must mean a smaller amount. Definitely going to have to give these a try! I have to say, though, I think you mean “bunch,” not “bushel.” That would be quite a lot of asparagus! I HAVE to try this! Looks so yummy. Great post!